Are you a Johnny Depp fan like me? Are you into a good Halloween oriented movie with Halloween so close? Are you creepy enough for Dark Shadows? If you don't know, you can take the quiz and find out! I have seen Dark Shadows and will say it was an interesting movie but then again, I'm a die hard Johnny movie so there wouldn't be much I wouldn't like with his name in the credits! 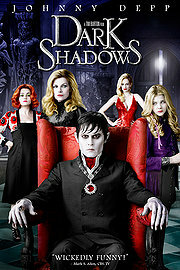 Now, thanks to Warner Brothers, you can have a chance to take the quiz and win a copy of Dark Shadows on DVD! *Disclosure: I was not compensated for this post. The Sponsor provided the prize. Warner Bros. Pictures is proud to announce the release of Dark Shadows on DVD and Blu-Ray October 2nd 2012; along with the Dark Shadows Blog App! From the incredible mind of Tim Burton comes the hit film Dark Shadows, based on the classic television series! Barnabas Collins (Johnny Depp) has been trapped for two centuries by an evil witch (Eva Green) who just happens to be an ex lover. Barnabas now has to struggle with the ever changing 1970s and save his families business! With an all star cast that includes Michelle Pfeiffer, Helena Bonham Carter, Chloe Grace Moretz, Jonny Lee Miller and more, Dark Shadows will be sure to whet your appetite for fun. I took the quiz and I'm "A CHILD OF THE LIGHT"
I'm Creepily Conservative! Thanks so much for the fantastic giveaway! I'm a child of the light! Thanks! A child of the light. I took this when it first started. Creepily Conservative.